I love teaching workshops. Not only do I get to meet some really neat authors and talk about my favorite piece of software ever, but sometimes I even get to play tourist (like on my March trip to California). My weekend visit to Colorado Springs was no exception. Eight years ago I spent a month in “The Springs” when my husband was there for training. The boys and I explored most of the city’s nooks and crannies, we all drove to the top of Pike’s Peak just to experience 14000 feet, and we checked out the Air Force Academy’s pretty campus and famous chapel. CS is a beautiful city flanked on one side by the magnificent Rocky Mountains, and on the other side by the endless expanse of prairie stretching into Kansas, so I was excited to get in a little exploring during my trip. I stayed with my friend Donnell Ann Bell—author of Deadly Recall and The Past Came Hunting—so I got to check out her neighborhood on my evening run, and eat at one of their favorite restaurants in Old Colorado Town. Her daughter took me on a morning hike in North Cheyenne Cañon Park where we went to the top of Mt. Cutler (about 7300 feet) and visited Helen Hunt Falls (not *that* Helen Hunt). Then Donnell and her husband indulged me with a trip to Garden of the Gods. 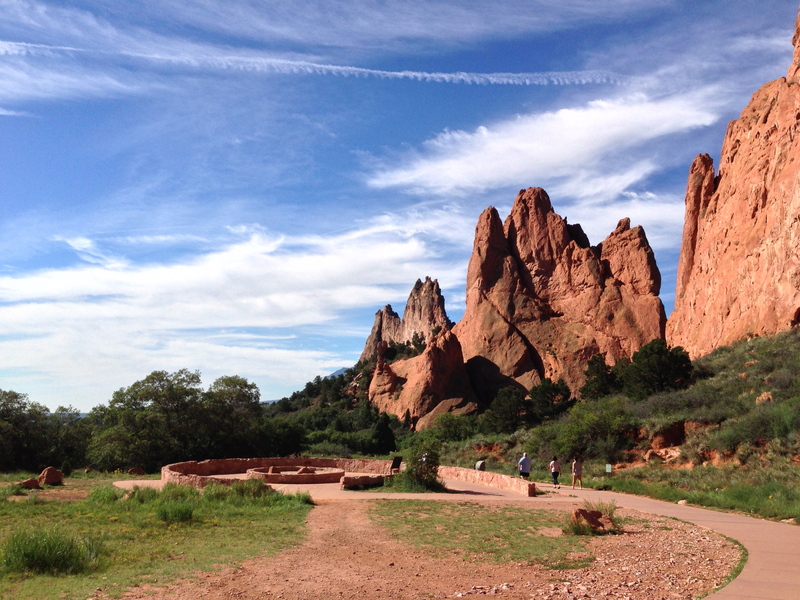 This park—which was deeded to the city by the Perkins family with the stipulation that it always be free of charge to the public—is a must-see if you go to Colorado Springs. So, yeah, the workshop went really well. Feedback was good. I made some new friends. And I got to see more than the inside of a conference room. Haha, Cristine. Always glad to help. 😉 Hope you can get in a nap! Beautiful pictures, Gwen! Would love to visit there someday! Thanks, Kathy. It’s definitely worth the trip. I’m so sorry I missed this workshop, I had another meeting conflict-bummer, big time. It would have been great to meet you in person. And Gwen, I was serious about the interview on my blog. When does your next class start? Oh, Leslie Ann, it would have been nice to meet you too. Some other time, maybe.